MDC Alliance leader Nelson Chamisa has announced a raft of changes to the leadership of the opposition party, including the appointment of Welshman Ncube and Morgen Komichi as vice-presidents in a move seen as trying to consolidate his position ahead of the elective congress next year. Ncube, who was among the MDC founding members and served as secretary-general before an acrimonious fallout in 2005 with party leader, the late Morgan Tsvangirai, was part of a grouping that contested the July 30 election as MDC Alliance. Komichi, who took over as chairman when Lovemore Moyo quit the opposition party in the run-up to the elections and formed his United Movement for Devolution (UMD), was appointed as one of the three vice-presidents. "Senator Elias Mudzuri remains vice-president, Senator Morgen Komichi, previously national chairperson, is appointed vice-president. Professor Welshman Ncube is appointed vice-president and Honourable Thabita Khumalo, previously spokesperson, is appointed national chairperson and Honourable Tendai Biti will be deputy chairperson," said Chamisa's spokesperson Nkululeko Sibanda in a statement yesterday. Biti broke ranks with Tsvangirai following the 2013 elections loss and formed the People's Democratic Party (PDP). Khumalo will be the leader of the opposition party in the National Assembly. Mudzuri will head the opposition in the Senate and will be deputised by Komichi. Chamisa's appointments, Sibanda said, were guided by instructions from the national council and resolutions made by the party's national executive. The 40-year-old opposition leader also appointed Jacob Mafume, a Harare City councillor, as the party's national spokesperson. Party secretary-general Douglas Mwonzora, who is believed to be a likely challenger for the presidency, remains in his position despite reports suggesting he could be purged. "The president is also working hard to return the party to its original strength by integrating members of the MDC Alliance into the MDC," said Sibanda, adding that the opposition party wants to be identified by its original name. "It is important that we underline the fact that the name of the party is MDC. Both MDC-T, MDC Alliance and other names that have been used in the past were simple electoral vehicles and were not the legal names of the party. The party that everyone is integrating into is the MDC," Sibanda said. Following the break-up with Ncube in 2005, the Tsvangirai party began using the moniker MDC-T to differentiate his group from Ncube's party, which went under the name, MDC-N.
Chamisa has also been locked in a bitter tussle for the use of the party name with former vice-president Thokozani Khupe, who now leads a breakaway group using the MDC-T name. Sibanda said Chamisa had also appointed Sessel Zvidzai as secretary for local government and devolution, with Clifford Hlatshwayo as his deputy. Biti's former deputy at the PDP, Kucaca Phulu, is now secretary for constitutional affairs. Long-serving party chief whip Innocent Gonese was replaced in the post by Prosper Mutseyami. 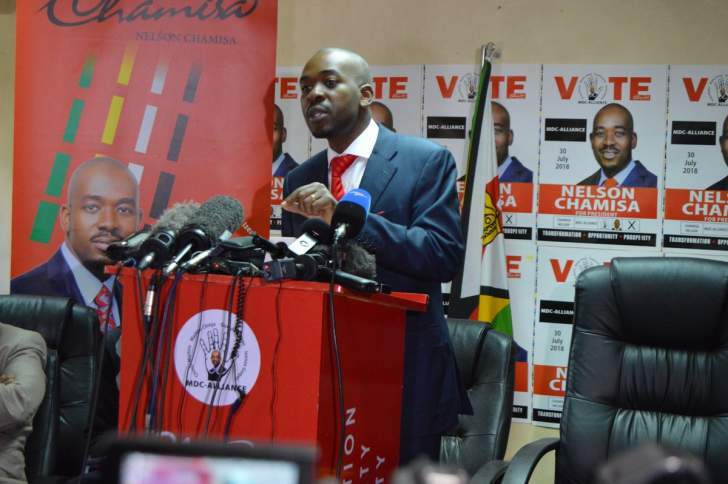 Analysts said Chamisa's appointments were meant to deal with possible threats to his position, with loyalists now in key positions and allowing him to control the party's direction in both Houses of Parliament in his absence, a move they said was undemocratic. "Chamisa should have allowed congress to elect the leaders as its ethos and values ought to show. The move is divorced from the grassroots and going forward, the MDC is now being run by elitists, a far cry from a people's movement they portray," political analyst Alexander Rusero said. "It is more telling that Tendai Biti, despite all he did during the past elections, he has been made a deputy to someone. I don't expect to see a strengthened MDC, but Chamisa consolidating his power base and so far he has managed to push Biti away from the power base."